multiIntenseCare by Fresenius Medical Care is a comprehensive concept for the supply of your ICU patients. It is designed to support the work of physicians and hospital staff in order to save lives. The multiFiltratePRO is a new-generation CRRT device that builds on the substantial experience with the multiFiltrate and the successfully established Ci-Ca® regional anticoagulation. The easy-to-read touch screen monitor allows recognition of key information even from a distance. Rotation around the horizontal and vertical axes enables adjustment for different-sized users and to different relative positions of the device and user. The multiFiltratePRO includes a graphic user interface that monitors and displays all relevant set-up and treatment data. The multiFiltratePRO supports the reliable application of citrate anticoagulation through comprehensive integration into the device. Intelligent software helps reduce the complexity of citrate anticoagulation. Infused volumes of citrate and calcium solutions are automatically balanced with the filtrate pump. If the blood flow is changed, the device automatically adjusts the citrate pump. If the filtrate flow is changed, the calcium pump is adjusted accordingly. The citrate infusion continues for a reliable, limited period of time throughout bag changes (dialysate, substituate, filtrate). This helps to avoid an early coagulation of the system. For routine adjustments of Ci-Ca® therapy, information from the Ci-Ca® protocol can easily be retrieved on the screen. When setting certain values outside the standard range, the multiFiltratePRO makes the user aware of potentially risky clinical situations. Reduced healthcare budgets and increasing cost pressure call for economic solutions. Taking all this together, minimised workload for the staff allows an efficient patient-nurse relation. 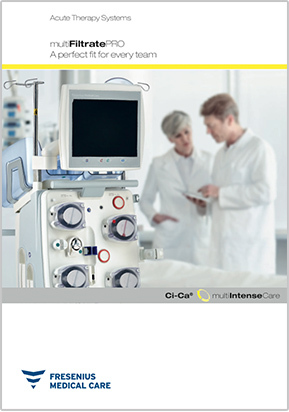 Fresenius Medical Care is the global leader in dialysis services and products. The highest medical standards are our benchmark. multiIntenseCare by Fresenius Medical Care is a comprehensive concept for the supply of your ICU patients, combining products, therapy assistance, training and education, and service support. Our product design follows a holistic approach: CRRT monitors, haemofilters, tubing systems and fluids are designed for a well-concerted clinical application. Bearing the clinical application in mind, Fresenius Medical Care goes beyond standard service and assists staff by providing complementary therapy information. Besides direct training on products and their application, Fresenius Medical Care participates in numerous events for physicians and nurses each year. A number of these events are certified by regional medical associations, some of them qualifying for Continuing Medical Education credits (CME). Intensive care units work 24/7 and CRRT can be required at any time. Through accurate device maintenance and quick repairs when needed, multiFiltratePRO is kept available to serve its purpose: delivering CRRT upon demand. I agree that my personal data, in particular my name and my email address is collected and stored by Fresenius Medical Care Deutschland GmbH in Germany and used by Fresenius Medical Care GmbH and its international corporate group (Fresenius Group) for the sole purpose of providing me with electronic marketing material (e.g. newsletters and e-Material). Personal data will be kept by Fresenius Medical Care GmbH in Germany in accordance with any applicable legal requirements, in particular data privacy requirements in the European Union, and to ensure correct delivery. If I request promotional and/or e-Materials and/or to be contacted by employees of Fresenius Medical Care GmbH in view of receiving further local or global medical information, I authorise and agree that Fresenius Medical Care GmbH will deliver my personal data to local subsidiaries. My personal data will not be shared with any other third parties. Fresenius Medical Care GmbH may also produce consolidated statistics which do not contain my personal data for improving the service. I have the right at any time to revoke my consent regarding the use of my personal data by sending an email to multiIntenseCare@fmc-ag.com. Similarly, I can deregister from the Service at any time by sending an email from my registered email address with the text “cancel newsletter” to multiIntenseCare@fmc-ag.com. For more detailed information on the new multiFiltratePRO, please download the product brochure.